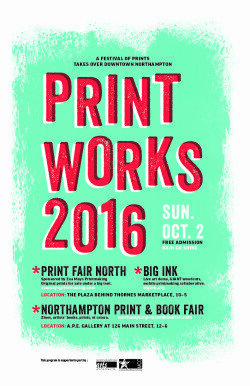 The 14th Annual Print Fair North, sponsored by Zea Mays Printmaking, has joined forces with the Northampton Print and Book Fair and BIG INK large scale woodcut printing for a festival of prints in downtown Northampton. PrintWorks 2016 will take place under big tents behind Thorne’s Marketplace. The show and sale features outstanding creative work of regional artists and studios. Festival goers can shop for original hand­pulled art prints in many sizes and price ranges. 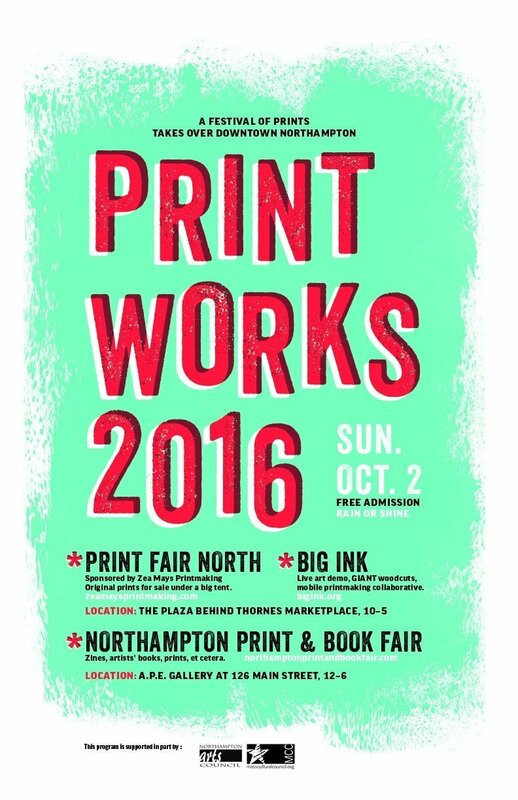 The downtown location places this print exchange in the center of Northampton’s thriving arts scene making it accessible to both casual shoppers and seasoned collectors. Festival­goers can expect to find art to suit all tastes, from colorful contemporary silkscreen posters to striking landscapes. Artists will be on site to ask questions and show their work ranging in techniques from the drypoint method (think Rembrandt) to the emerging photo­based prints. Cherry Hill Press (Worcester), Patrick’s Art House (Florence), Big Wheel Press (Easthampton), and Two Rivers Printmaking Studio (White River Junction, VT) round out the long list of last year’s talented participating studios. The event is free and open to the public, rain or shine. Zea Mays Printmaking is a printmaking studio in Florence, MA that has been offering workshops, research, and master printer services since 2000. Artists from around the world participate in Zea Mays’ mission to adopt sustainable printmaking techniques through unique eco­friendly mentorships, residencies, and exhibitions that showcase original art created with green methods.